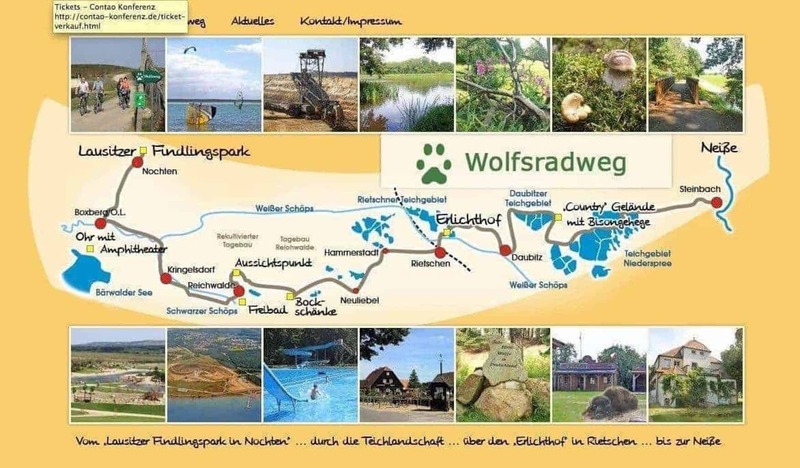 The Wolfsradweg (Wolf´s Bike Trail) in the saxon area of Lausitz offers you to follow the tracks of German’s first wolves, who recolonized the area in 2000. It is a great example of a sustainable tourism strategy involving the return of the wolves in Europe. Though this area shows beautiful landscape features, after the reunity of East- and West Germany, lots of people left. The one who stayed soon recognized the value of the returned wolves, not only from an ecological perspective, but also as a new tourism highlight. The Wolfsradweg leads 43km from Nochten to the Neisse, close to the Polish border, winding though the charming ‚Teichlandschaft’ (area dominated by ponds), passing the ‚open air-museum’ Erlichthof (where a Wolf-exhibition and Information office are located) to the river Neisse. Along the way interested bikers can stop at 18 wolf information stations and 3 shelter cabins while experiencing Germany’s first ‚Wolfland’ and lots of other attractions.